With medical marijuana being legal in 33 U.S. states and recreational marijuana being legal in 10, you may be wondering why so many people are pursuing medical cannabis as a natural treatment option. After all, marijuana is still labeled as a Schedule I drug by the Drug Enforcement Agency (DEA), along with incredibly addictive and/or psychologically detrimental drugs, like heroin, lysergic acid diethylamide (LSD), and 3,4-methylenedioxymethamphetamine (ecstasy). This classification of cannabis, of course, is being proven more inaccurate by the day, as further research is defying myths about medical marijuana use for people with severe or debilitating health conditions. 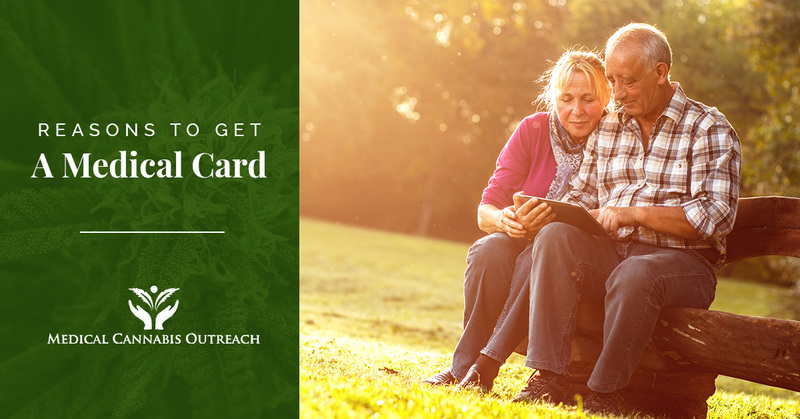 As the one-stop-shop for medical cards in Savoy, Chicago, and the surrounding areas, Medical Cannabis Outreach helps patients with qualifying conditions get the natural treatment options they deserve. Since medicinal marijuana was legalized in Illinois in 2013, more and more patients are using our medical marijuana licensing services, and we take pride in being able to help those in need of safer alternatives to prescription opioids. That being said, here are a few main reasons why it’s worth it to get a medical marijuana card if you have a chronic or severe health condition in the state of Illinois. Though it is still illegal at the federal level, medical cannabis (also referred to as “medical weed” or “medical pot”) has been legalized in more than half of the U.S. states — and rightfully so. Amid the national opioid epidemic, where addictive painkillers are claiming more than 130 lives per day, scientists and medical professionals alike are looking to medical cannabis as a safer option for symptom and pain management for those who qualify. In fact, recent studies are showing that medical cannabis has the potential to offset the opioid crisis, as fewer addictive painkillers are being prescribed in states where medical marijuana is legal. It is also worth mentioning that the side effects of medical cannabis are much fewer, if not entirely nonexistent, than those of synthetic opioids. For example, common side effects of morphine, tramadol, oxycodone, and other narcotic painkillers include nausea, vomiting, diarrhea, and muscle spasms (due to rapid dopamine release while blocking pain receptors), as well as withdrawal symptoms and ultimately, addiction. Medical cannabis, on the other hand, hardly has any side effects, and many of them are positive. These include an increase in appetite (nausea subsides), numbness to pain (CBD also offers localized pain management), and drowsiness (combats insomnia). The best part is, medical cannabis is not chemically addictive, and you cannot overdose. With the opioid epidemic at its turning point, prescription painkillers are becoming harder to get, leaving those who are dependent on them for pain management or to feed an addiction out of luck (many of them turn to dealers, which adds another level of danger). Since there is no evidence that medical cannabis is harmful to patients, especially when consumed in proper doses as part of a natural wellcare regimen, both CBD oil and THC (oil and flower) are readily available to those with medical cards. In fact, the medical marijuana is thriving amid the opioid crisis, and there is no shortage of THC or CBD products, making medical cannabis a practical and accessible form of treatment for many patients. If you are wondering how to get a medical marijuana card in Savoy, Chicago, or any of the surrounding areas, see the full list of qualifying health conditions here, or visit one of our six medical marijuana clinics throughout Illinois. Our cannabis-friendly clinicians and medical marijuana doctors would be happy to provide you with a free consultation and evaluation to determine whether you are a good candidate for the Compassionate Use Of Medical Cannabis Program. We offer fast and easy approvals for our patients and help them through every step of the medical card application process, from filling out and submitting the free application to having your photo ID taken. Click here for more information about our services, as well as what to bring to your first appointment at Medical Cannabis Outreach. Aside from the range of natural treatment options (in THC and CBD forms) and the availability of medical cannabis in a rapidly growing industry, another main reason to get a medical card is that it is affordable. In the state of Illinois, a medical marijuana license costs $100 for a one-year registration, $200 for a two-year registration, and $250 for a three-year registration. Veterans and patients with social security disability insurance (SSDI) receive a 50-percent discount on their registration if they are able to provide proof of SSDI and/or DD214/discharge papers when they submit an application. So, what’s the benefit of registering for a medical cannabis card if it costs you a minimum of $50 or $100 upfront? The only way to gain access to medical marijuana treatment in Illinois is to have a valid medical card, and the cost of non-psychoactive alternatives, like CBD oils, topicals, tinctures, and other CBD products, can be lowered substantially. Compared to the cost of CBD oil and recreational marijuana in other states where it is legal, a medical card grants you access to natural treatment at a much affordable price. And that’s not to mention all the money you save by not being prescribed prescription narcotics, which are not always covered by insurance companies and Medicaid. Plus, with medical cannabis and CBD oil, you won’t be looking at expensive rehabilitation costs, emergency medical bills (in the event of an overdose), or additional opioid taper medications to wean you off of addictive painkillers. We hope that this blog post has helped you understand some of the main reasons why so many people are choosing medical cannabis as a natural treatment alternative to addictive painkillers. Contact us today to learn more about the benefits of CBD oil and medical marijuana for a range of severe or debilitating health conditions, or visit one of our medical cannabis clinics in Chicago, Savoy, Shelbyville, Harrisburg, Pekin, or Wood River. We look forward to meeting you and evaluating you for a medical card in Illinois!